Today we're looking at George Hickox's "Training Pointing Dogs" DVD. George took four videos that he had and combined into one DVD, so it is a complete system. It shows everything from puppy introductions all the way up to using electronics, bird launchers, getting the dog to stay to wing and shot. So just a complete method. Very reasonable as far as what you pay and what you get. George has been doing this a long time, has a real solid training method, real popular. We've done real well with it. It's a good complete video. For folks that are looking train a pointing dog this is a great way to go. "The best training resource I have found!!" The best training resource I have found!! "No amateur should ever use an electric collar on a dog unless he has viewed a copy of this video." This is a great dog training guide. No amateur should ever use an electric collar on a dog unless he has viewed a copy of this video. It's simple as long as you follow the steps and are patient and put forth the effort you will be successful. I am giving this video as a Christmas present to my son-in-law who will be purchasing a pointer this spring. Can't respond to how good the video is as we haven't seen it yet. "Simple and clear, and I loved that he used young untrained dogs." Ally is 10 weeks old, and I can't wait to try some of the techniques out. Simple and clear, and I loved that he used young untrained dogs. "First time training a gun dog, and this video was an excellent resource." First time training a gun dog, and this video was an excellent resource. Highly recommend it. I am sure I will refer to it frequently. "There's so much detail it's hard to go wrong if you follow his instruction." The best investment I've made for training my dogs! There's so much detail it's hard to go wrong if you follow his instruction. Highly recommended! "I really like the information in this video. My only complaint is Hickox didn't finish the explanation on how he trains the retrieve." I really like the information in this video. My only complaint is Hickox didn't finish the explanation on how he trains the retrieve. I would like to see the training of the finished dog. Steady to wing and shot and then the retrieve. I am interested how he commands this portion of training. "With the aid of the George Hickox video, it has helped me get through the transition with ease and confidence." I was primarily a retrieving dog trainer, but have in the last 10 years have started training pointing dogs, which are a little more challenging. With the aid of the George Hickox video, it has helped me get through the transition with ease and confidence. Thank You Steve! "Seems to cover just about everything from beginning to end." I just got a good start using the CD, but it seems to cover just about everything from beginning to end. Instructions are very clear and easy to understand, and well thought out. Make training my dog look easy. "The instructions are very simple, thorough, and easy to follow." English Pointer. Hunts. Family pet. Just got the CD and viewed it once. The instructions are very simple, thorough, and easy to follow. Can't wait to get started. couldn't be without it, so I ordered another one. "I will for sure purchase more of George's videos in my quest to train my pup." GSP. Hunts. Family pet. Competes. The video is well put together with a ton of information. My only complaint (which is picky) was the advertising left the impression this was the only video you would need. Not so with me. Sort of like a teaser. I will for sure purchase more of George's videos in my quest to train my pup. "The training methods are sound and helpful." The dvd collection is good. The training methods are sound and helpful. The series seems a little vast though, it doesn't exactly go into much detail. The price tag also seems quite steep for a 1 hour DVD. The DVDs are a good source of information to be watched several times to and improve my method of training. Good info. Shows details too how a dog learns so you won't make mistakes that will confuse your dog. Its an okay video. It will get a guy started, but I think he lacks some depth. It feels like everything he says is rather rushed. The dogs he uses seem a little older than I would have liked to see. It's good for getting a good idea on hunting introduction, but when it came to basic commands and e collar intro I found it lacked a more practical approach. Get the tools you need to bring your dog to a world-class level. George Hickox teaches the how-to's of training gundogs to owners through this easy-to-understand and logical program that he has been teaching across North America for the past decade in his School of Dog Training for Owners and Their Dogs. Hickox has helped thousands of dog owners develop bragging rights hunting dogs, and this library of instructional videos will give you the tools you need to bring your dog to a world-class level. Hickox hosts wing-shooting adventures in Alaska, South Dakota, and Georgia. In addition, he is the Hunting Dog Editor for Shooting Sportsman Magazine, and a contributing writer for Pointing Dog Journal and Retriever Journal. Hickox's previous training videos have won numerous awards for instructional excellence. 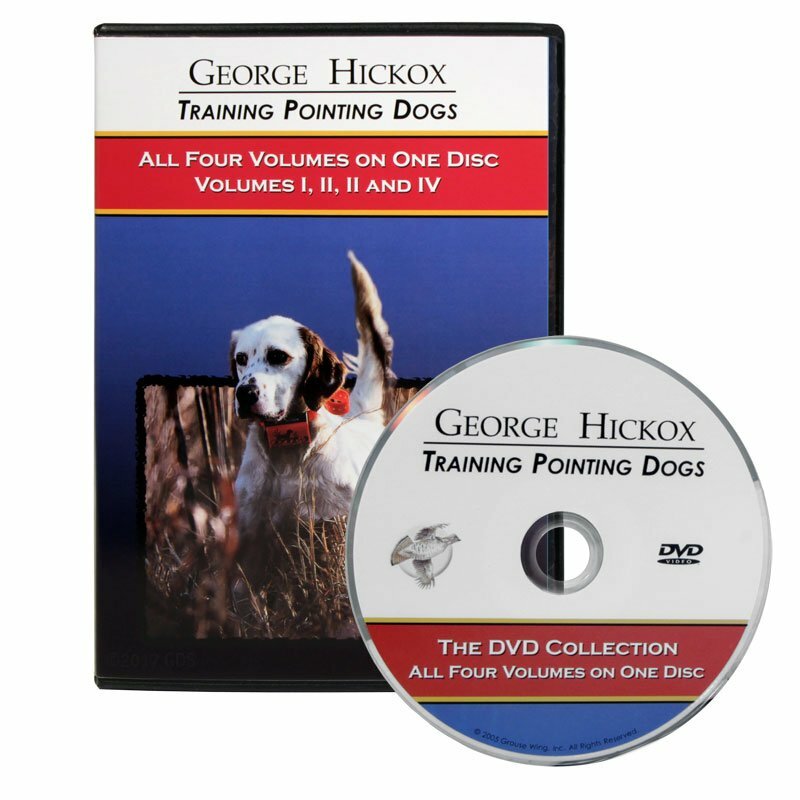 This new four-volume library of George Hickox - Training Pointing Dogs has been completely updated and is better yet. This DVD Collection includes the entire contents of volumes I through IV. This is the complete training program for your pointing dog from puppyhood through to a polished finished dog. George Hickox offers dog training schools for owners and their dogs across the country. For school dates and locations, and information visit their website www.georgehickox.com.